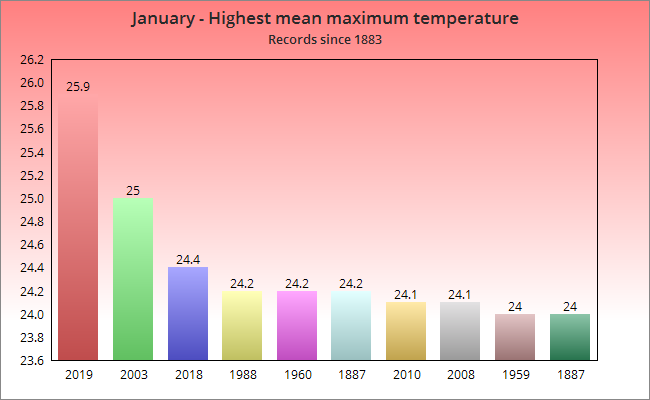 This was the hottest and driest January by far in 138 years of records. Rainfall total 0.4mm. Mean temperature anomaly +2.9c compared to 1981-10 ( below ) or +3.2c above 1961-90. The record heat was an extension of widespread high temperature anomaly across most of the continent. Blocking high pressure over the Tasman Sea ensured cool changes were brief and dry. Dry lightning ignited a number of bushfires resulting in smoky skies towards the end of the month. 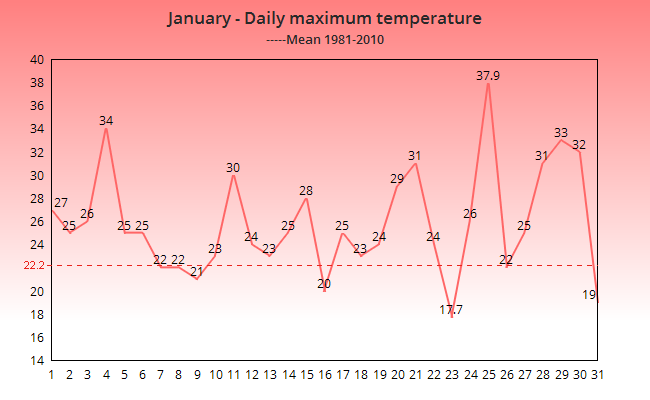 As well as being the hottest January it was the hottest month of any month exceeding February 2000 by +0.6c. 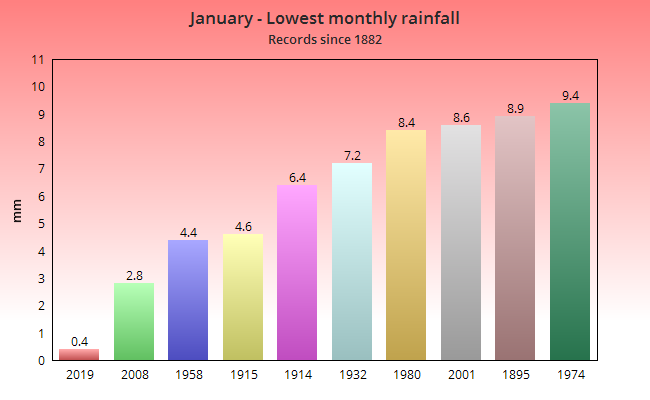 It was also the equal driest month of any month, equaling December 1994. Seven days exceeded 30 degrees and this is also a record for any calendar month. A dry month, frequent frosts with temps generally around average. By far the driest January in my area in the last 30 years with only 17mm falling beating 2017 which had 28mm. 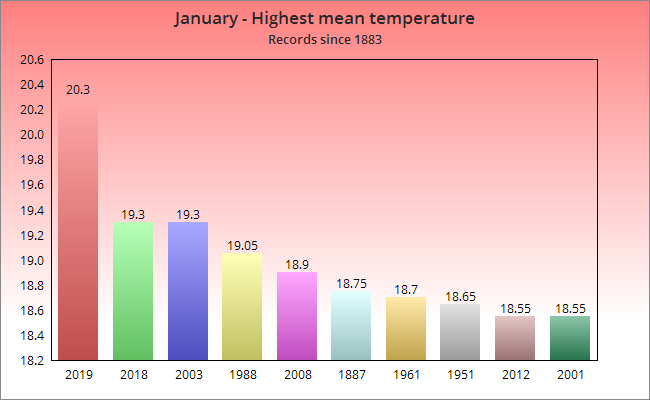 It was also the sunniest January on record with 73 hours of sunshine beating the record of 67 which wasn’t recorded in 2001. Temperatures were overall not far of average although the minima was slightly below average. 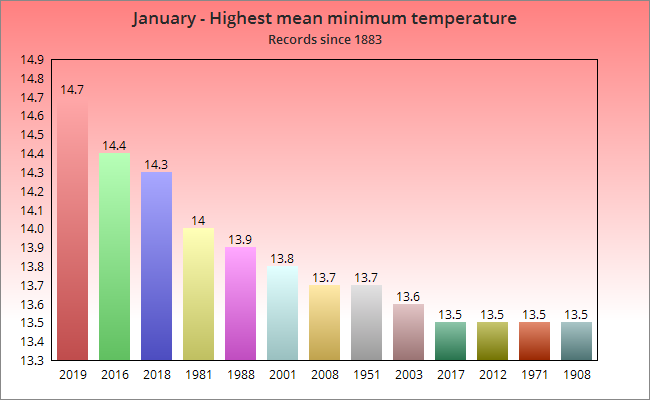 The month began rather mild but soon became colder, it became milder again from the 10th-14th before a cold snap between the 16th-21st followed by another mild spell before becoming very cold at the end. Snowfall total 3cm, days with lying snow 2, days with fog 1, no thunder heard. A dry month with temperatures generally slightly below average. Cold spells in the second and last weeks, with snow in the final days of the month.